The Wind Point Community Club produces a Village-wide directory with names and phone numbers of Wind Point residents. 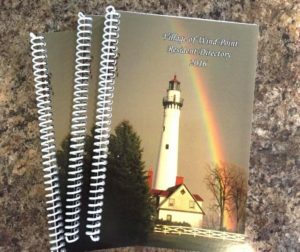 The directories may be purchased by residents at the Village Office for $6.00 each (cash only). To notify the Community Club of a change in the directory, please send an e-mail to check1@wi.rr.com.